Berwick, once a small agricultural town, now an outer suburb, is located 43 km south-east of Melbourne. 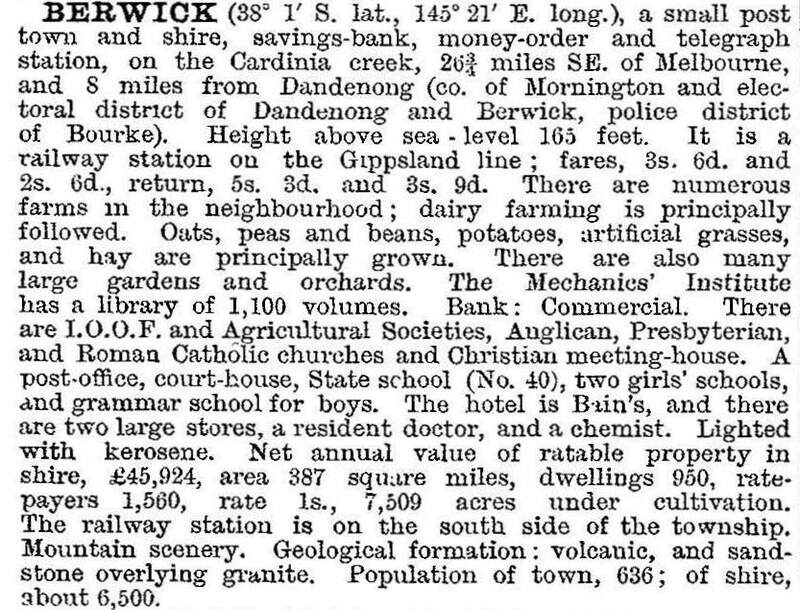 The area was part of Cardinia Creek run and was named by an early leaseholder, Robert Gardiner, after his birthplace, Berwick-on-Tweed. Land was subdivided in 1854 and soon a store, post office, hotel and other businesses were established. Wheat, barley and potatoes were grown on the fertile soil, with a flour mill operating for a while. Later dairy farming and cheese making became the main activities. The Berwick Agricultural and Horticultural Society started in 1856 as the Mornington Farmers' Society. The shows alternated at Cranbourne and Berwick but moved to the Berwick district in 1891. Since 1961 they have been held at Akoonah Park. The construction of a coach road from Melbourne to Gippsland, and then the railway from Melbourne in 1877, spurred continued development. Wilson's quarry, opened in 1859, supplied ballast for the railway line. A spur line connected with Berwick railway station to transport the metal. The quarry was an important industry, working fairly continuously over the years. The original quarry was given to the City of Berwick and developed as the Wilson botanic park. A district road board was created in 1862 and was proclaimed a shire in 1868. In 1902 the shire headquarters were moved to Pakenham. By 1903, the town described in the Australian handbook is substantial, primarily a service centre for an agricultural and dairying community. As well as a State School, a Boys' Grammar school operated from 1882 to 1922. St Margaret's Girls' school opened in 1920 and has grown steadily. In 1980, no longer a boarding school, it had about 480 pupils. An airfield was established in 1938, firstly for private use. It was also used for gliding from 1948 to the early 1960s. In 1968 Casey airfield was taken over as a commercial operation. Many of the large properties had their own cheese factories. The cheese factory at Springfield estate, Homestead Road, Berwick was built in 1865. It is of unusual construction and together with the nearby homestead is still in good condition. It has been restored and converted into a gallery and craft centre. There are a number of historic buildings in the area. One of the best known is Edrington, the home of parliamentarian and governor-general, Lord Casey. It is on the Victorian Heritage Register. Another historic building is the Border Hotel, licensed in 1857. Renamed Ye Berwick Inn, it contributes to the village atmosphere. This feeling is heightened by the numerous large exotic trees. An avenue of poplars at the eastern entrance to Berwick was planted as a World War I memorial. The avenue of honour, the inn and Peel and High Streets constituted the civic centre of Berwick, with St Margaret's school and the railway station to the south. Further east there are the Berwick showground (Akoonah Park) on Cardinia Creek and the Edwin Flack reserve, named after Australia's first Olympic Games gold medallist (1896) and stud cattle breeder at his Berwick property. Hallam, Narre Warren and Berwick, all on the Princes Highway/Gippsland railway corridor, began their spectacular urban growth in the 1970s. Berwick Shire became Berwick city in 1973, and most of the new population settled in the growth corridor. Berwick city's population went from 26,600 (1976) to 50,200 (1986). About 2 km west of the Berwick Inn a southern bypass freeway was built (1983) rejoining the Princes Highway at Beaconsfield. Berwick was still like a large country town in the mid 1980s, with its regional facilities – modern council offices (1978) and a drive-in shopping centre – at Fountain Gate, Narre Warren. A high school (c1977) (1456 pupils, 2014) was out in the paddocks. Between the post office and the railway station there was St Margaret's school and the bush nursing hospital, and west of the station the Casey airfield. Within a little over ten years the airfield had a Monash University campus and an adjoining TAFE. A Haileybury College campus (1989) and houses filled the areas between the freeway, the railway and the old Princes Highway. Berwick primary school (1032 pupils, 2014) was moved out of the town centre and Berwick Lodge (1990) (543 pupils, 2014), Berwick Fields (2006) (1104 pupils, 2014) and Berwick Chase (2009) (685 pupils, 2014) State primary schools opened. East of the TAFE, Beaconhills College opened in 2003 and next year the Casey Hospital replaced the bush nursing hospital. A purpose built school for blind and vision impaired students opened in Berwick in 2014. By 2010 Berwick's urban growth to the south had reached the edge of Clyde North's farmlands; to the north it was advancing toward rural Harkaway. Much of the intervening northern space is reserved for public purposes, a welcome breather after a tripling of the population in less than 15 years. Local shopping is found along High Street and at a small adjoining drive-in centre known as Berwick Market Place.